Some of the most trafficked news websites and popular apps went down Tuesday in an apparent massive denial-of-service attack from a number of countries. Sites like Drudge Report, The Associated Press, Google services, Breitbart, along with popular phone applications like Snapchat, Spotify and Discord also went offline. Twitter users across the platform claim servers went down due to one or several coordinated attacks on these sites by overloading the servers with traffic in what is called a denial-of-service (DDoS) attack. Government websites, like the U.S. Department of the Treasury, also went down, but are now back up and running. Google is reporting it suffered a power outage that took down Spotify and Snapchat. “We are looking into DDoS attacks impacting the [stability] of our services,” video game publisher Ubisoft’s user support account wrote in a tweet Tuesday afternoon. “We’re currently monitoring DDoS attacks impacting Ubisoft services and causing players to be unable to connect to games. The attacks are focused on our games connections and server latency, which we are working on mitigating. Thank you for your patience as we resolve this,” the game publisher also tweeted. The highly popular World of Warcraft also went down, game-maker Blizzard wrote in a tweet Tuesday. 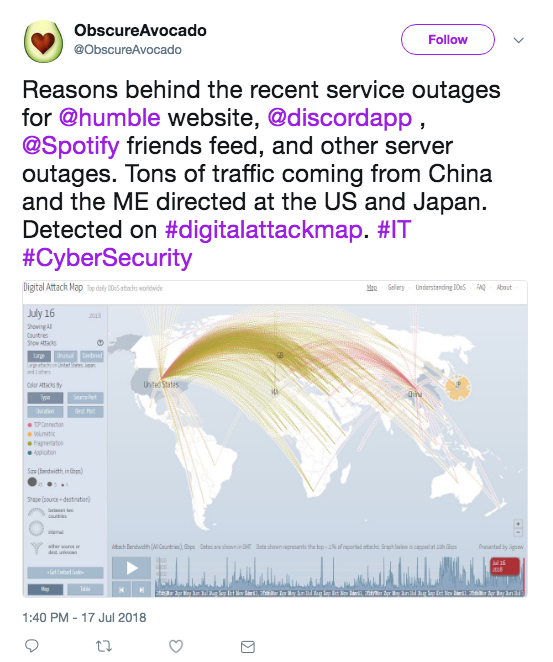 The source of the attack could be coming from a number of countries, like China, India or the U.S. itself, according to DigitalAttackMap.com, which a Twitter user refers to in the screenshot below. Pictured is a screenshot of a tweet from ObscureAvocado captured on July 17, 2018. Here is what users saw when they attempted to visit Drudge Report, Breitbart, or AP news Tuesday for a period of time in the afternoon. It’s not clear if every single one of these websites went down due to a DDoS attack, or if it’s a coincidence. The Daily Caller News Foundation reached out to several platforms for comment and will update this article if and when a response is provided.